I'm vastly relieved to report that peach season has started at last. While peaches are one of my favorite fruits, the real reason I'm rejoicing their coming is their meaning to my palate- the heralding of fall. While it's still over a hundred here and too hot to bake much (my apologies for skipping Tuesdays with Dorie's apple bars), peaches mean that fall is coming. Soon it will cool down, I'll have my baby (35 days to go! ), and I won't be so hot all day long! Whip Cream and set aside. In the same bowl, mix the cream cheese, sugar, and vanilla until light and fluffy. Remove bowl from stand mixer and gently fold in the whipped cream. Peel and slice peaches. Place in large bowl with citrus juice and gently toss peaches to cover (this will prevent browning). Add blueberries in carefully then add sugar to taste (depending on ripeness of fruit). Set aside. 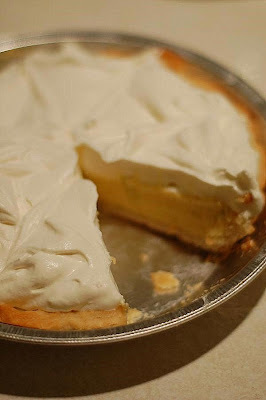 Spread cream cheese mixture in cooled crust. 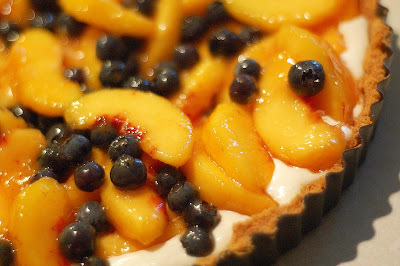 Spoon fruit on top carefully and refrigerate until ready to serve. 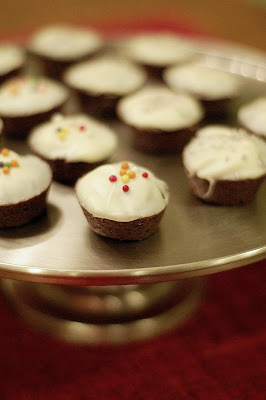 I made these cute brownie buttons last summer and was so infatuated a left an embarrassingly adoring comment on Dorie's blog. This time I made them early- I couldn't wait since they were so great last time! The chocolate is complimented but an almost undetectable flavor from the orange zest. The white chocolate is perfect on top and looks great, too. I added some sprinkles this time around because I was making these as a birthday treat and thought that would be festive. ~Freeze any leftovers to enjoy later- they thaw out great and even taste awesome frozen! I'm slowly getting around to posting my Bastille Day recipes and hope some of you will give them a shot. French food is delicious and doesn't have to be tricky. 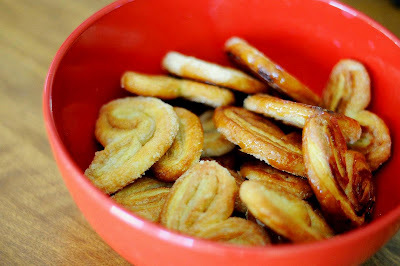 In fact, these palmiers are the easiest dessert I've made in a long time. And probably one of the most popular, too (I love when that works out!). Palmiers are a crunchy cookie that you can buy from any little bakery in Paris. They come in all sizes and are so simple to make. All you do is roll a sheet of thawed puff pastry in sugar (I added cinnamon for the health benefits, haha) and then roll it up into a log, slice, and bake. It's simple and delicious. I followed Ina's recipe and it worked out great. If you are only baking for a few, you could just make one sheet's worth and make cheese straws with the rest (or apple turnovers, or tomato and goat cheese tarts, there's a lot of options with this stuff!) 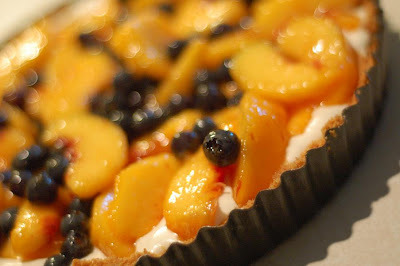 I also served them with a fruit tart that is easy to modify and so delicious. 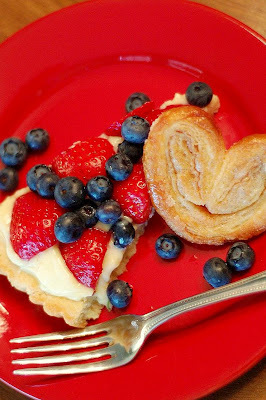 The rich pastry cream and fresh fruit really complimented the crunchy cookies. If you happen to have any leftover (not really going to happen in my house, but maybe your family has more self control) don't store them in an airtight container as they will soften. I'd recommend just baking off the amount you need and freezing the rest like I've seen Ina do. Then just keep them in the freezer for a last minute treat. Yesterday I forgot to announce the winner of last weeks giveaway- Leslie M! 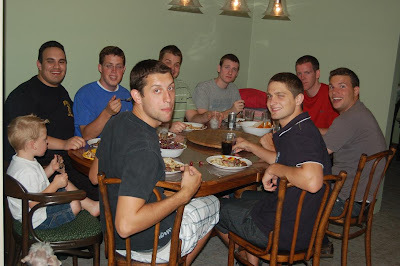 Thanks everyone for the wonderful suggestions for summer dinners and ice cream flavors. I have work to do now! Combine the sugar, cinnamon, and kosher salt. Pour 1 cup of the sugar/salt mixture on a flat surface such as wooden board or marble. Unfold each sheet of puff pastry onto the sugar and pour 1/2 cup of the sugar mixture on top, spreading it evenly on the puff pastry. This is not about sprinkling, it's about an even covering of sugar. With a rolling pin, roll the dough until it's 13 by 13-inches square and the sugar is pressed into the puff pastry on top and bottom. Fold the sides of the square towards the center so they go halfway to the middle. Fold them again so the two folds meet exactly at the middle of the dough. Then fold 1 half over the other half as though closing a book. You will have 6 layers. Slice the dough into 3/8-inch slices and place the slices, cut side up, on baking sheets lined with parchment paper. Place the second sheet of pastry on the sugared board, sprinkle with the remaining 1/2 cup of sugar mixture, and continue as above. (There will be quite a bit of sugar left over on the board.) Slice and arrange on baking sheets lined with parchment. Serve with ice cream for a delicious and simple dessert! TriColore French Tart recipe here. So with my good excuse to use the cute pan and the nutritional need for the bananas, I made this recipe the day it was announced. 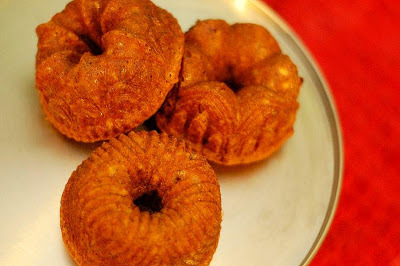 I forgot to sub whole wheat flour but think that would turn out great in this recipe. I also used about 2 tablespoons less of the sour cream in exchange for some extra banana. I followed the recipe available on Serious Eats and it came together in a flash. I love that about banana bread. I added chopped pecans for the nut lovers in my family (which, if I keep baking with Dorie, I just might end up in that category- much to my mom's shock). This half recipe made the perfect amount for my six (one cup) mini bundt cakes. The results? My husband wolfed these down. I sent them to his work to share, but everyone happened to be out of the office, so he ate them on his own. When I'm feeling a bit more ambitious, I'll make this again to serve with vanilla ice cream and a caramel sauce. He'd love that. The poor guy doesn't eat chocolate but I try to help him forget by dressing up other desserts. He always appreciates a TWD monthly line up with a few recipes he can enjoy. My favorite banana bread recipe is still the one my mom uses, from the Lion House Recipes (used for 3 bucks on Amazon, go go!). I have a few more bananas on my counter, a few more weeks being pregnant, and an eternity to cook for my non chocolate eater. I think I'll make that version soon and post it here. It's wonderful (and has less fat than Dorie's recipe!) Honestly, though, with bananas, butter, sugar, and pecans- I don't think you can go wrong! Today I rolled out of bed, late (7:10, haha!) since my son is "speddin da nite" at his Grandma and Grandpa's. My tall man and I had a hot date last night watching the new Harry Potter and capped it off with a good slow morning (for me anyways, he's out mowing the lawn- maybe I should make him some waffles?). I checked my email, without insistent tugs on my leg for a glass of milk, some cereal, or to come play outside in the heat, and found a new header in my inbox from my wonderful and talented cousin (who I pretend is actually my sister in law). Well needless to say I was excited, because let's be honest, I haven't worked on my blog layout in a while and even when I do work on it, I don't have any idea what I'm doing. I should ask my legit brother in laws for help, because they're actually programmers, but it just hasn't panned out. Hopefully the layout will get more attention soon, but until then, at least there's good food around here. And good food for trade for some programmers help. I can, however, upload a new header, so I did that and sang Kristi's praises in my quiet little house. 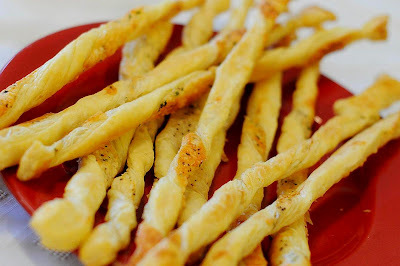 And since I can't post again without a recipe, I thought now was the time to post Ina's cheese straws I made for Bastille day a few weeks ago (because it was Kristi, brilliant Kristi, who requested them). This simple appetizer requires only a sheet of puff pastry, an egg, some cheese, and some herbs. It only takes a few minutes in the oven and leaves a big impression- I'll just say that even the toddlers wolfed these down. 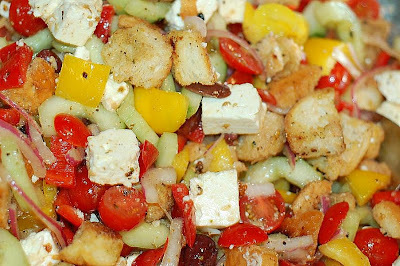 These make a fun appetizer and everyone was more than willing to munch away, but I think you could even turn these into dinner with a nice salad or soup. I know I'll make them again. PS Don't forget to check out Kristi's photography and design site here... She also does amazing invitations and announcements. Roll out each sheet of puff pastry on a lightly floured board until it is 10- by 12-inches. 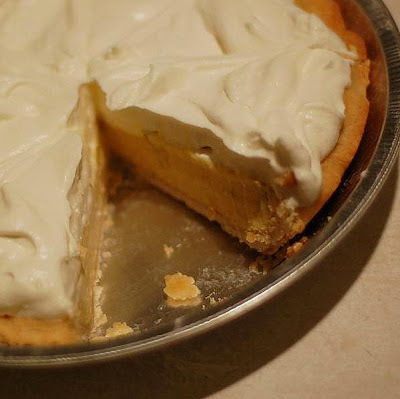 Beat the egg with 1 tablespoon of water and brush the surface of the pastry. Sprinkle each sheet evenly with 1⁄4 cup of the Parmesan, 1⁄2 cup of the Gruyère, 1⁄2 teaspoon of the thyme, 1⁄2 teaspoon of the salt, and some pepper. With the rolling pin, lightly press the flavorings into the puff pastry. Cut each sheet crosswise with a floured knife or pizza wheel into 11 or 12 strips. Twist each strip and lay on baking sheets lined with parchment paper.